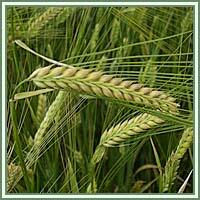 Habitat: Barley is native to British Isles and central Europe. 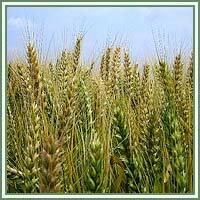 Description: Barley is considered to be the first cereal grain cultivated by humans. It is an annual plant with stout and simple, hollow stem and narrow, tapering leaves. Flowers grow in bristly-bearded terminal spikes, producing oval and furrowed barley grains. Medicinal use: Barley grass is considered to be an excellent antioxidant. It is recommended for the numerous types of ailments: arthritis, asthma, anemia, constipation, diabetes, hypertension, impotence, kidney and skin disorders. The root contains hordenine, which has a function to stimulate peripheral blood circulation. The root is also used in treatment of bronchitis. Barley bran is considered to lower cholesterol levels. Recent studies suggest that its antioxidative effects could help in treatment of certain sorts of cancers (leukemia, brain tumors and prostate cancers).